One clear day in spring, the two of us, Seijiro Murayama and Toshiya Tsunoda, went out to a park on the outskirts of the city of Yokohama. It was just like a picnic, but what we carried with us was a snare drum, not a lunch basket. We settled in a wide open space in the park and took a look through the inside of the snare drum, just for fun, to see how the world looked in that peaceful spring sunlight. That day Seijiro didn't play his instrument. We placed a pair of microphone inside the snare drum and tried to catch its sound under various conditions. 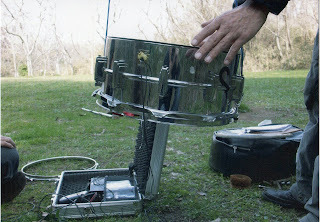 He loosened the drumhead, took off the rim, put a heavy stone on it, hung it from a tree branch, and even cut the drum skin with a knife …After two days of this strange picnic, we had gathered a total of 80 sound recordings. None of them includes a familiar snare drum sound. In fact, the sounds of these recordings are not generated with an ordinary 'musical' instrument, but result from the same instrument regarded merely as an object and perhaps also the act of breaking down the instrument into its physical pieces. Hopefully, still, another of our actions (the act of recording) reminded us of its nature as a musical instrument. Because of our general indifference to audio-technical details, we didn't take notes on the individual recordings. In our point of view, the differences among the takes are not important for the sake of the sound itself, or to the purpose of discerning them. On the contrary, the differences are only significant to the differences themselves. When you listen to these sounds coming to you in the stream of similarity, you'll find yourself listening to the threshold of yourself. It was just these differences that amazed us. What we offer here is not so-called 'beautiful' sounds. As for us, it is something more, chaotic, primal, and abundant.